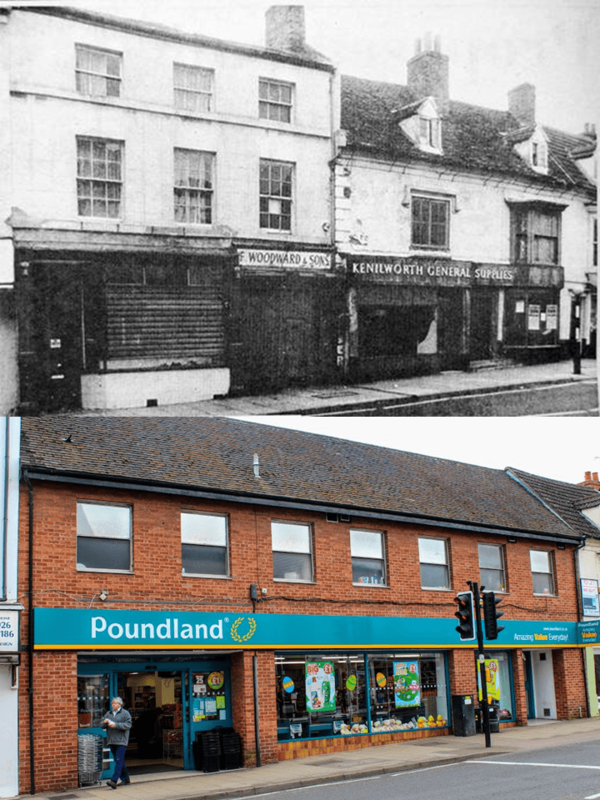 The chipping away of pre-20th Century buildings on Warwick Road during the last 75 years has left us with numerous Then & Now examples such as this one. Listed building status didn’t exist until the Town and Country Planning Act 1947 and even then it only really applied to exceptional historic properties. Local conservation pressure groups only really started springing up in the mid 1960s when old buildings not covered by the listing process started regularly becoming targets of developers and town planners, who were not overly concerned with character and aesthetics. Even then they were often powerless to intervene or simply resigned to picking their battles over the more alarming demolition schemes. The body that is today KHAS started out in 1962 as the Kenilworth Society Historical Study Group, an offshoot of the Kenilworth Society whose founding aim was to organise talks and open meetings about local matters. However, a historical society staffed by volunteers has to choose carefully which schemes to lend its objections to so it can focus its efforts on the most deserving cases. A search through the society’s early newsletters from the 1960s and 1970s does not reveal any documented objections raised to developments like those shown here. The Society was gearing up for a fight to preserve Little Virginia in 1973 which took precedence. Later on, members of the Society were at least able to inspect the fabric of buildings before they were demolished to discover whether they contained remnants of timber frames or sandstone walls, suggesting the building was older than its facade might suggest. The adjoining property Over The Moon (16 The Square, extreme right of the ‘now’ image) was recently found to have an ancient sandstone interior wall, as detailed in Norman Stevens’ article in Kenilworth History 2017. Another example; the facade of The Lion pub is not dissimilar to that of the Kenilworth General Supplies building shown here. However, The Lion is in fact a listed building containing timber framing and sandstone walls, showing that its is in fact a much older building with a later facade. So, unless some enlightened individual took it upon themselves to survey such buildings and raise objections to their demolition where warranted, or at the very least record what was to be destroyed, all we are left with is old photographs and unanswered questions over the nature of the buildings we have lost. The site is numbered as 18-24 The Square. In the 1970s the Keymarket supermarket chain opened a store on this site, built in a what might be described as a brutalist style. Keymarket was in turn bought out by Gateway which was itself bought out by Somerfield, during the course of which the site was rebuilt largely as we see it today before becoming a branch of Co-Operative Food. However, since the arrival of the likes of Sainsbury’s and Waitrose chains such as these have been pushed out of the town. Discount stores now rule the roost and the site was first taken over by The 99p Stores and is currently occupied by the Poundland discount store.